Any quantity only $60.00 per coin over spot! 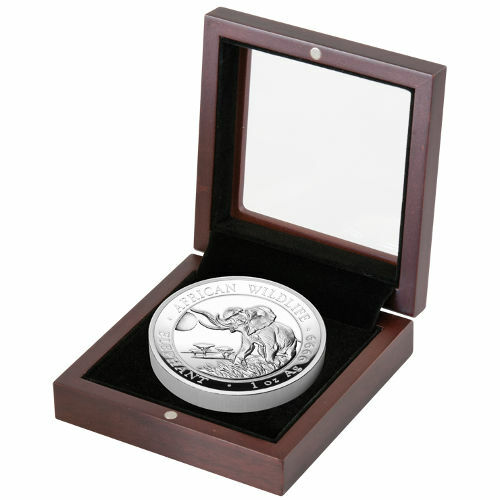 The Silver Somalian Elephant bullion coin has been the most popular product from the African continent since its introduction in 1999. Despite a tumultuous history, the Silver Somalian Elephant features purity that investors love and evolving designs that collectors covet in a commemorative coin. Today, the 2016 1 oz Silver Somalian Elephant High-Relief coin is available on Silver.com for purchase. Thirteenth release of the Silver Somalian Elephant. Struck in brilliant High Relief! Ships to you in a presentation box. Consists of one troy ounce of .9999 fine silver. Issued a face value of 100 Shillings (Somalia) by the Bavarian State Mint. Features the all-new 2016 Elephant design. Bears the Somali coat of arms on the reverse. Silver Somalian Elephant coins are released on an annual basis by the Bavarian State Mint, with a brand-new image of the elephant on the obverse each year. 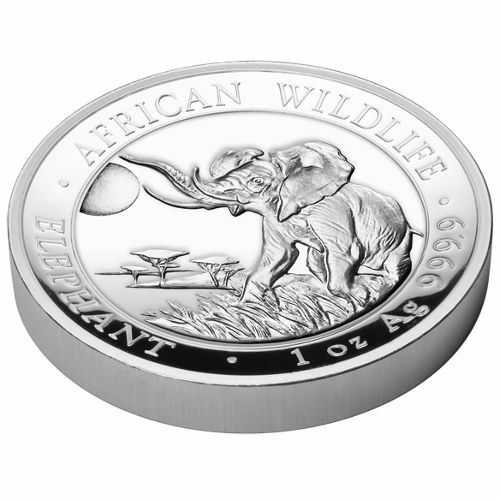 The African elephant is one of the most iconic and well-known species from the African continent, and was a natural choice for a coin program with the title African Wildlife Series. The all-new image on these 2016 Silver Somalian Elephant coins is a flexible one that could display an elephant at the edge of a watering hole either during daylight or the evening. The background of the design features an object that could be either the sun or moon high in the sky, giving this coin a unique interpretation in the mind of each individual. Each 2016 1 oz Silver Somalian Elephant coin in this listing is a high-relief product. High-relief strikings are more complex than bullion or proof production. In order to create the contrast of a high-relief finish, the Bavarian State Mint strikes each blank multiple times under immense pressure to help the design set standout from the background field. On the obverse side is the image of an adult elephant at the side of a creek or lake, with its trunk raised as it bellows out a call. 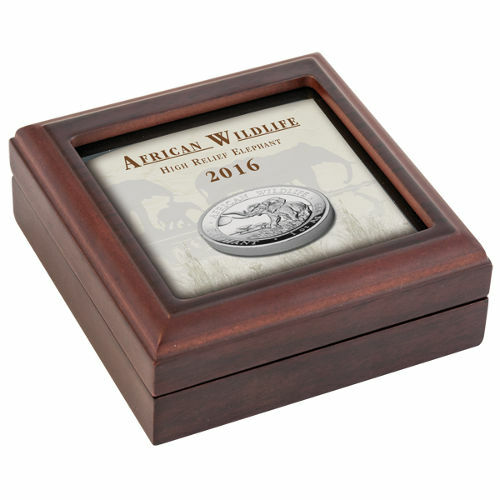 “African Wildlife” and the coin’s weight, purity, and metal content are featured in engravings on this side. The reverse features the coat of arms for the nation of Somalia. Engravings include “Somali Republic,” the coin’s year of issue, and the face value of the coin. These 2016 Silver Somalian Elephants are unique in that they are the first in the series to feature .9999 pure silver, a boost from the previous .999 purity level. Please direct your questions to a Silver.com associate at 888-989-7223, online using our live web chat, or via email.